The Hitchcock Band Department presents its annual spring band concert Wednesday, May 1st at 6:30 in the Santa Fe High School auditorium. The Bulldog band is in the process of having a recording made for the “Texas State Honor Band Competition” and Santa Fe High School has graciously allowed us to use their state of the art auditorium. The recording needs to be in an environment where noise can be kept to a minimum . . .
4/15/2019 From: D. Greathouse, Hitchcock High School Head Golf Coach. 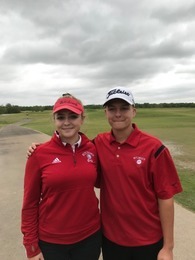 PRESS RELEASE: Brianna Landry and Caeden Landry of the Hitchcock High School Golf Team have qualified for the 2019 District 24, 3A Regional Golf Tournament in Brenham, TX, April 22-25. The siblings became regional qualifiers at the district tournament . . .
For the 3 rd Nine Weeks at Stewart Elementary A Honor Roll Third grade: Silas Jones. Fourth grade: Patrick Brock, Zoila Brooks, Javon Burnett, Anjelica Garcia, Trenton Phillips, Tyrone Richard Jr., and Cashman Urbanek. Fifth grade: Xavier Breitschopf, Kolten Cantrell, Melanie Davis, Jayvon Freeman, Julie Olvera, Dawn Petteway, Ke’Shon . . .
6 th grade A honor roll Aracely Castillo, Yahir Cortez, Jhayla Fontenette, Angel Isidro, Amerie Lopez, Zane wall, Tyler Williams and Christiona Wilson A/B honor roll Connor Allen, Ariana Bartolomei, Jonathan Benavides, London Bouldin, Nikyah Bourgeois, Loi Bui, Judge Clemons, Si’Maya Clemons, Donald Davis, Harley Davis, Jord’n Dixie, Jared Dotson, Daereon . . .
April 15 - 24 - Tryout announcements and packet pick up April 24th 3 PM all packets due No exceptions April 29th Manadatory Parent meeting - review packet and expections etc. Camp Dates: April 30, May 2, May 6,7,and 9th Try-outs May 10th More Information will be provided in the Packet. Dear Parent/Guardian, We are excited to inform you that our school has enrolled with STOPit! STOPit is an online reporting tool designed to deter and mitigate bullying and cyber abuse, consisting of an app and a back-end incident management system for school administrators. Our students will have access to the STOPit mobile app, which has two simple but powerful . . .